Home News #News: Mauritius Bans Entry To Nigerian Nationals & Other Ebola Affected Countries Regardless Of Where They Are Travelling From! #News: Mauritius Bans Entry To Nigerian Nationals & Other Ebola Affected Countries Regardless Of Where They Are Travelling From! If you have a Nigerian passport and you are travelling to Mauritius you WILL NOT BE allowed entry into the country…regardless of where you are flying from! The decision was allegedly made by the Mauritius government on September 12 to ban travel to Mauritius for nationals of of Guinea, Liberia, Sierra Leone, Nigeria, Senegal and the Democratic Republic of Congo due to the recent outbreak of Ebola! 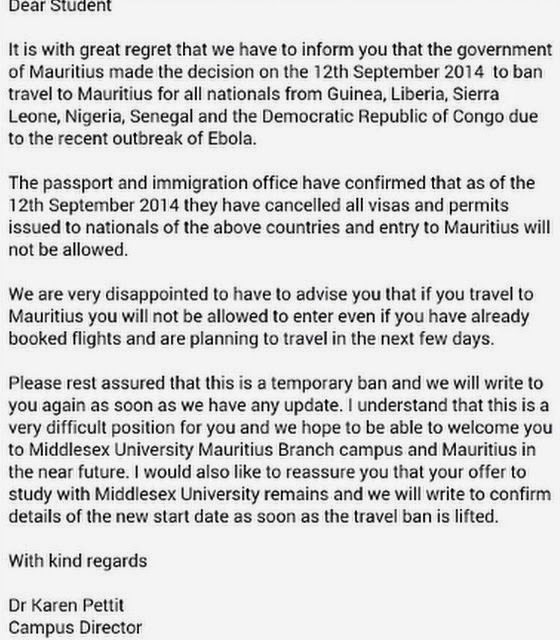 The shocking information was revealed in a letter the Campus Director of Middlesex University Mauritius Beach Campus wrote to a Nigerian student. Why the hell did Mauritius include Nigeria in the list of nationals banned? According to the Minister of Health there is currently no case of Ebola in the entire Nations! And how does banning Nigerians that do not live in Nigeria even make sense? !